Author Sophia Small’s newly released “The Little Book John Ate: State of Emergency” is a personal reflection and analysis of Scripture’s relevance to the author’s life. “The Little Book John Ate: State of Emergency” from Christian Faith Publishing author Sophia Small is an account of true events from the writer’s perspective and a candid appeal to God for guidance throughout her journey. “The Little Book John Ate: State of Emergency”: an honest personal reflection and examination of Scripture for solutions to difficulties in the author’s life. “The Little Book John Ate: State of Emergency” is the creation of published author Sophia Small. Published by Christian Faith Publishing, Sophia Small’s new book is a look at the author’s life through the lens of her personal relationship with God, “Prophecy has to be fulfilled. The seals have been opened in the Book of Revelation. One such seal is The Little Book John Ate. The Almighty God said the kingdom has come, and he can give it to whomever he chooses. I have been awarded the opportunity to reveal to you the contents of the book. It pertains to wickedness and the oppression suffered by the prophets and the children of God. The book was sealed until the kingdom was declared, when the wickedness reaches its highest point that it threatens to destroy the foundation on which we live by. God had to act quickly to show you we are alive and cannot let the church die. My life depended on it. View a synopsis of “The Little Book John Ate: State of Emergency” on YouTube. Readers can purchase“The Little Book John Ate: State of Emergency” at traditional brick and mortar bookstores, or online at Amazon.com, Apple iTunes store, Kobo or Barnes and Noble. 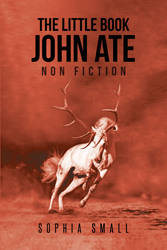 For additional information or inquiries about “The Little Book John Ate: State of Emergency”, contact the Christian Faith Publishing media department at 866-554-0919.